Hey dolls! We have one more new Twinsie joining us this week – Lisa from The Polish Playground! She’s super sweet and always leaves comments on my posts, so I’m glad to have her come aboard for TT. I took the easy way out for this week’s theme of being inspired by either a food or beverage. I did my nails around 11p and the only way I could complete this week’s look was to go for an untried with a food in the title. I had no energy at all for nail art! 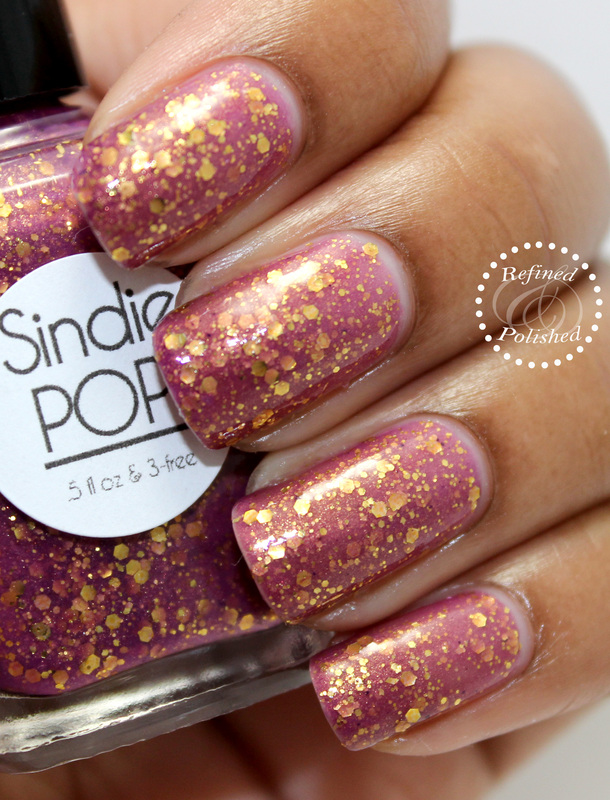 Sindie Pop Golden Raspberries fit the bill quite nicely, as this is a shade I’ve been looking forward to wearing. The formula applied very easily and the glitter was dense. Golden Raspberries was sheer on the first coat, but built up to opacity in two. I really like this shade and the various sizes of gold glitter. The color is so hard to describe though! It’s an interesting red-ish, purple mix. Either way, I’m here for it. Be sure to check out what foods or beverages the other Twinsies were inspired by!